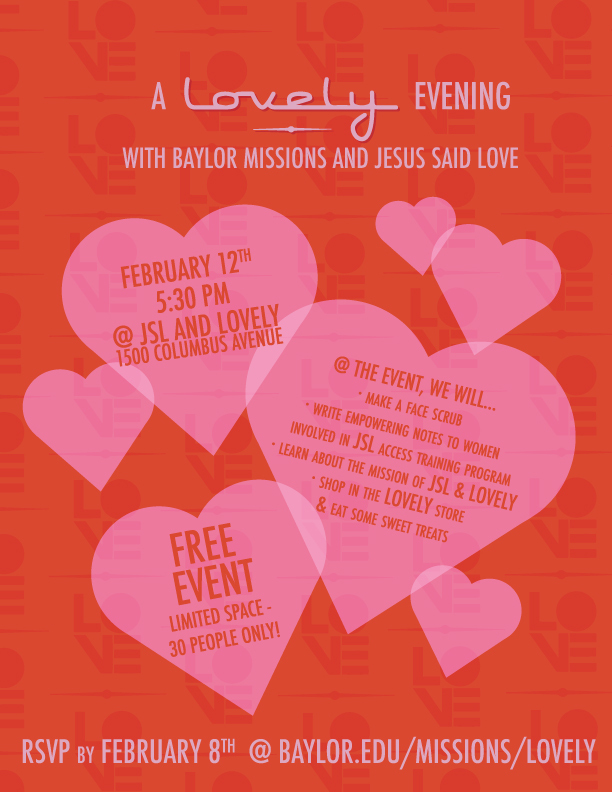 February 12th from 5:30-6:30pm AND 6:30-7:30, FREE to any Baylor Student! CARPOOL: Need a ride? Got extra seats in your car you could spare? Meet at the Bobo at 5:10. Let us know on the survey if you need a ride or can give a ride! MEET YOU THERE: coming from somewhere else or gotta go right afterwards, you can just meet us at JSL at 5:30. Space limited to 100. 2 event options: Event#1 starts promptly at 5:30, may end before 6:30 pending how much you shop :) Event#2 starts at 6:30-7:30. EVENT ONLY OPEN TO THOSE WHO RSVP, dont just show up! Enjoy special treats from local vendors who support JSL. Oh yea, and SHOP in the Lovely store to buy fun stuff for your friends and significant other for Galentines/Valentines Day!